Payments must be made in order for us to reserve a ceremony date at your loved one's unit. Please make sure you select the proper code for your unit, or else your service may be cancelled or delayed. This code was provided to you in your access instructions email. 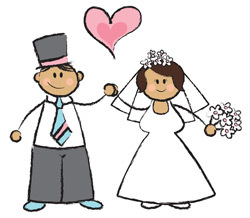 We will accept payment plans for marriages, however you must make a down payment of $25.00 before you start any wedding process with Wife and Inmate Connection. Be sure you have spoken to a Wife and Inmate Connection Representative to work out arrangements. If you have not please contact 281-849-1539 or email wife.inmate@yahoo.com before selecting payment plans below. In order to hire Wife and Inmate Connection for wedding services, we require a down payment of $25.00. This down payment will be applied towards your fee for officiant services. Please Note: If you choose to cancel or void marriage services with Wife and Inmate Connection, this fee is non-refundable under any circumstance. Once payment is made you and your incarcerated loved one will receive a full marital packet of information from Wife and Inmate Connection. Please include your incarcerated loved one's information in the notes section at check out. If you have paid your $25.00 down payment and would like to pay the remaining balance due in 2 payments, select the correct item below. - Divided into 2 equal payments only. Please Include Your Loved One's Name and Unit in the "Notes" Section at Check Out! Before making this payment, you agree that you have read or have been made aware of the Wife and Inmate Connection Refund Policy and Disclosures. You agree to the terms and services set within such policy and disclosures.